Acclaimed alternative folk trio Wildwood Kin bring their UK tour to The Stables next week. Sisters Beth and Emillie Key and their cousin Meghann Loney released their debut album Turning Tides in August. The LP followed the single Taking A hold which was also released that month. Wildwood Kin borrow heavily from early folk influences, but their debut album delves deeply in to other genres, featuring both electric and acoustic instruments, boasting inventive sonics and spectral atmospherics alongside their three-part harmonies. 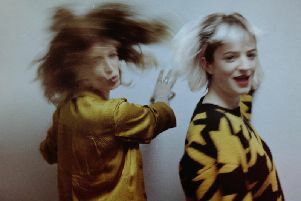 In 2015 they were shortlisted for a major BBC Radio Music Award and the following year their debut single Warrior Daughter spent several weeks on the Radio 2 playlist. Their tracks have notched several million streams on Spotify and they feature on every track on Seth Lakeman's top 2016 top 20 album Ballads of the Broken Few. Wildwood Kin played at the Glastonbury Festival this summer and have previously headlined the BBC Introducing stage at Somersault festival and played at the likes of the Cambridge Folk Festival and Beautiful Days. They have toured extensively and supported The Oh Hellos, Lakeman and Ward Thomas. Wildwood Kin headline Stage 2 of The Stables in Wavendon on Tuesday, October 24. Support is by Hannah Scott. Tickets cost £12 in advance before fees. Doors open at 8.45pm.